UNC Asheville will present two archaeology lectures during the fall 2018 semester – on Sept. 19, focusing on competing claims to Holy Land artifacts, and on Oct. 22, unearthing the relationship between Spanish soldiers and Native Americans in a 16th century settlement near Morganton, N.C. Both talks are free and open to everyone as part of the Archaeological Institute of America’s (AIA) 123rd Lecture Program that will bring leading scholars to audiences across the U.S. during the 2018-19 academic year. The lectures take place at 7:30 p.m. in UNC Asheville’s Rhoades Robinson Hall, Room 125. Sept. 19 – Who Owns the Past? Competing Claims for Antiquities from the Holy Land, presented by Morag Kersel – In Israel it is legal to buy and sell artifacts from legally sanctioned dealers, if the collections pre-date the 1978 national ownership law—however, not all aspects of this trade are legal and some items for sale may or may not have a complete or pristine ownership history. This interdisciplinary investigation examines the relationship between the demand for Holy Land artifacts and the competing claims to owning the past. 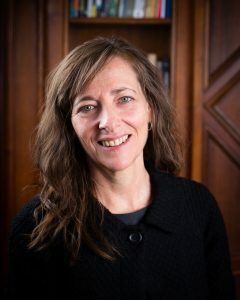 Kersel, an associate professor of archaeology at DePaul University, is an AIA Joukowsky Lecturer for 2018-19. She also co-directs the Following the Pots Project in Jordan and the Galilee Prehistory Project in Israel. 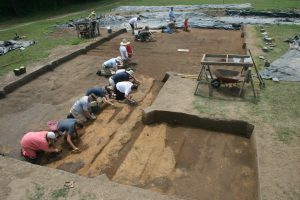 Oct. 22 – Artifacts from Fort San Juan and the Stories They Tell, presented by David Moore – Fort San Juan, located at the near Morganton, N.C., is the earliest European settlement in the interior of the United States. Built on the Native American town of Joara in 1567, the fort was occupied by 30 Spanish soldiers. The resident native peoples hosted the Spaniards as guests, building houses for them and supplying them with food. While the two groups lived side by side for over a year, the encounter ended suddenly when the fort was destroyed by the local Joarans. Moore is professor of anthropology at Warren Wilson College and his lecture will be delivered in celebration of International Archaeology Day. These lectures are co-sponsored by the Western North Carolina chapter of the Archaeological Institute of America, and UNC Asheville’s Departments of Classics, Art, and Art History. For more information, contact Laurel Taylor, UNC Asheville senior lecturer in classics and art history, ltaylor@unca.edu or 828.251.6290.